A New Broom at Daybreak? This past weekend I started the process of building up the usual end of year posts. Those are less like the random creative writing assignments I churn out daily as they require some data collection. The easiest of the lot is the review of my annual predictions. You can find the 2016 batch here. I was going down the list zeroing out the ones that were clearly wrong… start with the easy stuff… which included the fifth entry on the list. 5 – Daybreak will get a new head honcho who will be selected from another company and will have little or no experience with the fantasy MMORPG genre that has kept the team in San Diego funded for most of its existence. Expect this person’s past experience to be the hammer and any Daybreak problem to be a nail. They’ll be just like that VP we once hired from Oracle, for whom every solution required a database. So if, for example, they have a history with first person shooters on the XBox, you’ll know what to expect. I marked that as a miss. I hadn’t seen any news pop up to indicate that long time SOE/Daybreak guy Russell Shanks wasn’t still running the show. I mean, when Smed “left” there were stories everywhere. No change meant no points for that prediction. Daybreak abides. In October 2016, Russell Shanks left Daybreak. Ji Ham is the current acting president. Oh ho, there was a change! Maybe I was right in that prediction after all? It also seemed I didn’t miss any headline articles about it in the gaming press as the supporting attribution for this was Russell Shank’s profile on LinkedIn. You can go find it if you like, but this is the key item. So Mr. Shanks was out in October, which leads us to the next question; who the hell is Ji Ham and where did he come from? Well, I was already on LinkedIn for the first bit, might as well continue there. 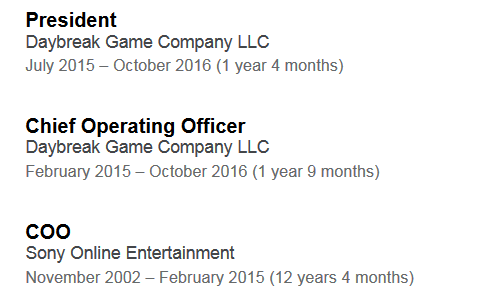 As it turns out, Ji Ham is a Columbus Nova Prime operative and his profile lists him as being “Co-President” of Daybreak since the date of Smed’s departure. From his profile. Odd that we haven’t heard of him before. Did I miss that somewhere along the line? Has he been actively involved with Daybreak up to this point or has he been more behind the scenes? And, of course, the bigger question is, what does it mean now that Russell Shanks is out and Ji Ham is in? The Wikipedia article says he is the “current acting president,” which sounds temporary, but the article also has no source to back that up. And given that Ji Ham is listed as having been Co-President since July 2015, it would not be a stretch to assume he has simply taken over the role rather than keeping the seat warm for some new hire. So what does it mean to have Ji Ham in charge? Googling him puts him with the Special Opportunities fund at Columbus Nova. His Bloomberg profile says that he was head of Columbus Nova’s renewable fuels group at one point, which seems to connect into the Russian Renova Group. Is Columbus Nova Prime now poised to frack Daybreak hard? Or is Ji Ham just the watcher for Columbus Nova Prime, the on site enforcer, there to keep an eye on whoever they put in charge? And, if so, can we expect a new leader with video game industry experience? And, finally, how do I score my prediction? Russell Shanks is out, so I don’t feel this is a complete miss, but is Ji Ham really a new head honcho? He is certainly from a company different that Daybreak. I’m allowed partial credit, so what should it be? 8 points? 2 points? You can probably expect the prediction scoring post next week. Addendum: And naturally the edits over a Wikipedia that I saw were done by Feldon of EQ2Wire. It is a small world. Addendum: Daybreak confirmed the essential elements of this post without adding any additional details. This entry was posted in Daybreak Game Company, entertainment and tagged Columbus Nova, Ji Ham, Russell Shanks, Video Game Industry News on December 2, 2016 by Wilhelm Arcturus. Great investigative reporting! If you played DCUO that would deserve a byline in The Daily Planet and a gruff “good job” from Perry White. Hmm…come to think of it, where are the secret identities in DCUO? I’d actually forgotten all about Russell Shanks. All the parts of DBG’s portfolio that I’m interested in seem to be ticking along nicely with a greater percentage of the announcements and changes coming out finding favor with me than I would have expected from SOE over a similar period. All the names I see are the same ones I’ve seen for years – Holly Longdale, Kander, Ttobey, Gninja, Kaitheel, Domino…so it hadn’t even occurred to me there might have been a change at the top. I still find it very hard to believe that Columbus Nova plan on actually owning an MMO game studio long term but really, who knows? @Bhagpuss – This post actually started as an email to you asking if you had seen anything on this change, but then I kept piecing together bits and decided to just make a blog post out of it. As I added to the post itself, Feldon was the author of the changes on Wikipedia about this. The comments at Massively OP (which picked it up from here) and MMORPG.com (which picked it up from Massively OP) are… well… the usual range of emotions. I like the guy who thinks this means Daybreak will bring back Vanguard. Also, judging from the referrals, this has been posted a few of times to various Daybreak forums where the threads have been since deleted. DBG forums are not a happy place for so many reasons. Even so, you wouldn’t think commenting on the publicly available information on who’s actually running the company would be out of bounds. Perhaps they’re planning on a big, official press release and they don’t want spoilers. Or maybe they just hope if they cross their fingers and whistle no-one’s going to notice. Can’t blame the Russians for the fascist board management. It got like that when SOE still owned it. @drmom5 – I assume you mean the forums when you say, “board management,” because you would be spot on there. SOE/DGC has managed to do that badly in so many ways over the years it boggles the mind.